This is going to be sort of a long post, but any advice would be extremely appreciated. A little back story, I've owned a few budgies and cockatiels in the past. Have another budgie now (who did his first flight recall today. Off topic, just super excited about it). I've always wanted a big parrot. They just seemed like awesome pets. I finally found myself in a position where I felt like I'd be able to afford and commit myself to the long term relationship and responsibility that is parrot ownership. Found a pet store in my area that actually had the bird I've coveted since I was young, a greenwing macaw. She is 10 years old and has apparently been through 4 different owners already. So I saved my pennies and visited the bird at the store regularly until the day finally came where I was able to bring her home. At the store, she was calm and seemed to already be warming up to me. Needless to say, I was thrilled. I was warned the week before I finally got her that she was "wanting to have a baby." After bringing her home, at first things went pretty well, she didn't seem too freaked out, she stepped up to me a few times, sat next to me without trying to get away, everything seemed perfect. Then, my girlfriend spent about two hours with her, talking to her and trying to gain her trust. After that, the bird very suddenly decided she wanted her as a mate. After that, everything flipped. She went from letting me pick her up and being uncomfortable with my girlfriend, to letting my girlfriend scratch her head, handle her, and play with her, then trying to bite me when I come too close. She actually got me a couple times early on (macaw's beaks are no joke), but I've learned to avoid trying anything when I see the signs leading to a bite. It was very surprising especially because the owner told me that she has never bitten anyone under any circumstance. On that note, though, the bird still lets me give her treats and will still take them from my fingers gently and careful not to accidentally bite me. So I assume it's just when her hormones are really flaring up that she feels the need to really bite me. Another thing to note is that she was clipped when I adopted her, so I think she also has confidence issues keeping her from being able to respond to unwanted human interaction well. So I guess what I'm asking is; Is there any way I can work with the bird to begin the training process with her? Am I just going to have to wait out mating season until her hormones have calmed down? I have only had her about a week now and understand it will take time, but my goal with her is to eventually be able to get her to start trick training and also NOT be a "one person bird." Also, if we keep going down the path we're currently going down, will her one-person-ness and distrust of others persist past mating season? Because before she chose her "mate" she was pretty sociable. I have been searching for fertile Bantam chicken eggs for Rainbow. Though I have her on a the proper diet and lighting she is still hormonal. She used to wait for my Chick Chick to lay her egg then sit on it. Being second person is not a bad place to be. Have your girl friend cut down on time with her and you increase your time with her. Eat with her. Many Paronts have changed their diets for the healthier because they want their birds to eat a healthy diet of veg and fruit. Oh yes, welcome to the forum. Macaws are different to read than other birds. Watch her tail. A spread tail indicates that a bite may be coming. Welcome to the forum! To reply to your question, no, there is nothing you can do to start training now but, even if the bird was not hormonal, you still would not have been able to do it because you need to bond with them BEFORE you start training. When you adopt an adult bird, you need to allow time for the honeymoon period [when they are all 'sociable' as you call it ] to end and when, if you have done everything right, the bird begins to feel comfortable in its new home and starts trusting the new owner. And yes, it sounds as if the bird [was it DNAd a female?] is very hormonal... Macaws pair up with a mate when they are about 2 or 3 years old but they don't actually breed until they are about 4 so the bird you adopted is at a difficult age [young and full of 'pep' and ready to breed]. And, if it has been kept at a human light schedule, not fed a fresh food diet daily and free-fed protein food instead [pellets being the worst thing in this case because they are made out of soy] -which, considering the fact that it was kept in a store, is most likely, you have a bird that is overly-hormonal. But birds breeding seasons are not like mammals [meaning cyclical], they are governed by environmental clues [length of daylight hours, food and weather] so unless you keep it at a strict solar schedule with full exposure to dawn and dusk and do not free-feed protein food, the bird will continue being hormonal for the entire year, an unnatural, unhealthy and very uncomfortable [even painful] condition for them and the main cause of what people call 'behavioral' problems -which are not behavioral or problems but simply bad bird husbandry [please research avian photoperiodism and avian reproduction]. Now, the hormone problem will be solved eventually IF you keep her at a solar schedule and do not free-feed protein food. It will take months and months but it will happen because is what nature evolved their bodies to react to. The 'chosen human' problem is another matter because although the bird could change its allegiance from her to you, there is really nothing you can do to make it happen. It will either happen or it won't, it's entirely up to the bird. BUT just because you are not the 'chosen one', it doesn't mean you cannot have a good relationship with it! You can - but the bird cannot be overly hormonal because, when they are, they will bite anybody they perceive as competition for their beloved's attention and only react positively to their beloved and, in your case, your girlfriend is the beloved and you are the competition. Ergo, the first thing you need to do is evaluate the bird's light schedule and diet and bring both to what they need to be. Then, you have to restrict your girlfriend's interaction with her and with you because, unless you are planning a wedding soon, it would be unfair to the bird to allow it to bond deeper with a person who is not going to be there all the time - and, if the bird sees you two canoodling in any way, it will make it worse for you to win it over [overly hormonal birds are VERY jealous and possessive!]. Last but not least, restrict your interactions with the bird to non-physical ones for now [don't even ask her to step up for now]. Mind you, this is the way to go with any rehomed bird, even ones that are not overly hormonal or which have not chosen somebody else as their human! Parrots don't like it when strange people take familiarities with them the same way that we don't like it when a stranger does with us. You would not like a stranger to walk up to you and ask you to grab their hand so they can direct you where they want you to go, right? Well, that would be the equivalent of a new owner asking an adult parrot to step up to their hand. 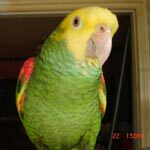 A dog or a cat raised by humans would not normally mind but a parrot would. Thank you so much for the detailed reply, but it does raise just a couple more questions. First of all, most of that sounds pretty easy to do, just waiting and non-physically interacting with her is already part of my daily routine. Getting the girlfriend to limit her interaction might be a little difficult, but I'll convince her it's all for the greater good. About the diet and sunlight though, there are multiple windows in the same room as the cage, so she's getting pretty much whatever light cycle the sun is dictating, is that going to be a problem? Should I try to move her cage into a different part of the house? Get blackout curtains? As for diet, I really need to be pointed in the right direction. The store owner gave me a bag of Vita Parrot blend for her, which has seeds and what looks like dried berries in it. Other than that, I've given her nuts, a little bread, apples, and bananas. I tried to get her to eat romaine lettuce and broccoli but she was absolutely not having it. Tried mixing the nuts in with the veggies, but she picked through to just eat the nuts. From what you're saying, it looks like I need to eliminate all (or most) of the nuts from her current diet so she isn't getting so much protein. But apples and bananas being the only non-protein food I've gotten her to eat, I worry about other nutrients getting to her. Just like with my budgie, it's going to be so hard to not try and rush a relationship because she's so beautiful and interesting. But I need to remember, with the budgie when I did finally slow things down, progress sped up, and now we have a great thing going on. Lots of windows in the room is great but, if there is light whatsoever coming in from the street at night [street lamps, people's outdoor lights, cars driving by, etc] you will need a blackout material to cover her cage once she is already asleep. The trick to a solar light schedule is exposure to dawn and dusk without a single artificial light interfering with it for a period of, at least, 1.5 hours [I do it for 2] o you can't turn on any light before the sun is up or after the sun is halfway down to the horizon [and this is actually much harder than it sounds]. A to the diet, I feed all my bird the same breakfast and 'adjust' their protein intake in their dinner. Macaws eat a lot of fruit in the wild but they also consume nuts so don't eliminate the nuts outright [nuts are better protein than seed, with the exception of quinoa and hemp]. If you feed the protein food at night, he will be much more willing to eat produce in the morning as long as you eat it with her because parrots, being born very altricial, learn what to eat from other parrots so the 'monkey see, monkey do' is 'programmed' into their brains. And all parrots take to gloop because the whole grains cooked al dente resemble the seeds they love so much. Navre wrote: Macaws are different to read than other birds. Watch her tail. A spread tail indicates that a bite may be coming. It is the same with Amazons. It is like an early warning system.